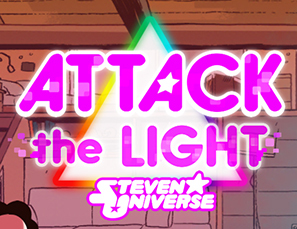 Having no knowledge or experience of Stephen Universe, I bought Attack the Light on iOS after seen positive tweets about it from a couple people I follow. I'm glad I did. What met me was an interesting RPG that was fun in short bursts for the most part; a repetitive structure ultimately wears thin before the conclusion. 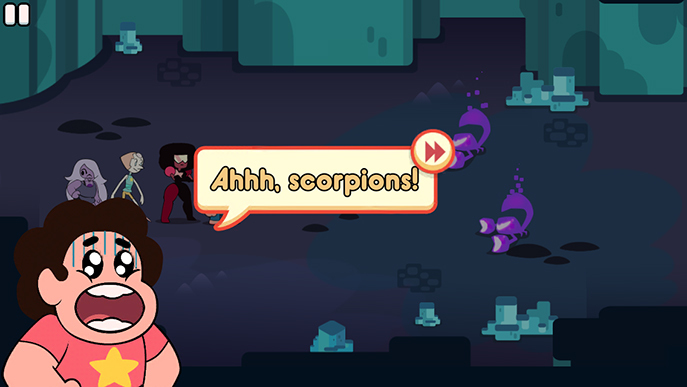 Stephen is at home playing games when his three Gem friends: Garnet, Amethyst and Pearl, suddenly appear. Upon touching an artefact, monsters – light creatures – are set loose across the world. Time to adventure out to right your error. There are five dungeons in total, each with four stages, a boss level and a number of secret areas. To navigate a level you swipe the screen in the direction you wish to go to. Ultimately, the aim is to reach the end portal to progress to the next area but there are things that stand in your way. The battle system is the game's strongest point but also holds a lot of problems. It is turn-based; you receive five star points at the start of each turn. Using the character's abilities will use up a number of them and upon reaching zero you end your turn and defend the enemy's approach. 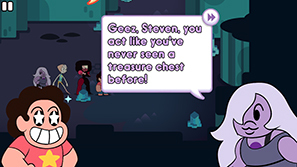 The three Gems are the attacking characters and Stephen acts as support; able to boost stats, heal and use items. The attacks have a fun level of interactivity. You'll either have to tap the screen at a precise moment to gain an extra strike, stop a moving bar in the correct place or aim your attack manually. Same for when you're defending. This requires focus as enemies attacks can have unusual patterns and will result in high damage if you do not defend correctly. 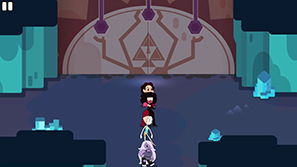 The Gem characters felt fairly unbalanced throughout. I mainly used Garnet, by far the strongest with an attack that only used two star points, to defeat enemies. 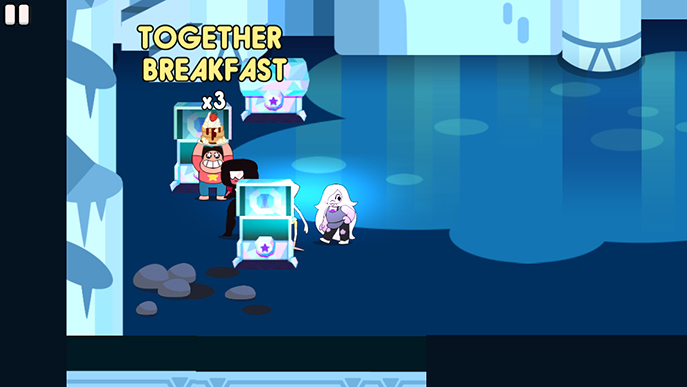 I would occasionally use Pearl to finish off a weak enemy and Amethyst just stood there not contributing. Stephen's buffs and healing are especially useful, particularly in the last two dungeons where the difficulty increases a little. 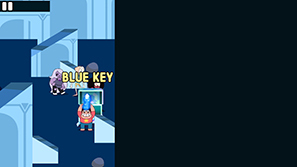 Other than the battle system there are a few simplistic puzzles – finding keys, remembering patterns to input and secret rooms to find – and these will cause no issue for the player. Of course, the game's younger audience was taken into consideration but I don't think anyone would have too much trouble. The problem I found when playing it for twenty minutes, twice a day until completion was there was no change. The final dungeon feels exactly like the first. The fighting system I adopted worked on every enemy type and I didn't need to shake it up at all. The levelling system was helpful to increase stats but other than for Stephen I didn't use many of the new abilities. The game looks fantastic and animates very well. Each dungeon has a clear theme and enemies (though some repeating) respond to that. It was a lot of fun for the first three dungeons and it was only fatigue that causes my slight hesitation on the game. I'd imagine knowing the television show would benefit the player's experience with Attack the Light but it isn't necessary to enjoy the game. It was a pleasant distraction on my train journey commutes for a couple weeks (ousting Super Smash Bros for 3ds) and while I'm a little disappointed it didn't reach its early potential it still remains recommendable.